BELTON, TX – The 2014 University of Mary Hardin-Baylor football team won’t report to campus for nearly three months, but the Cru is already pulling in preseason recognition for the upcoming season. UMHB is ranked fourth in the country and the Cru also has one Preseason All-American in the Sporting News 2014 College Football Preview. UMHB was picked fourth in the nation by the Sporting News. Defending national champion Wisconsin-Whitewater is tabbed to repeat, one spot ahead of national runner-up Mount Union. Linfield College is picked to finish third and Wesley College rounds out the top five. Two of the Cru’s 2014 opponents are also ranked by Sporting News with University of Redlands picked 24th and Millsaps College coming in at #25. UMHB will open the season at Millsaps on September 6th before returning home to host Redlands on September 13th. Cru offensive center Sterling Cantue was also named Preseason All-American by Sporting News. Cantue, a senior from Beaumont Central High School, started all 14 games for UMHB last season and was voted to the American Southwest Conference All-Conference Second Team. 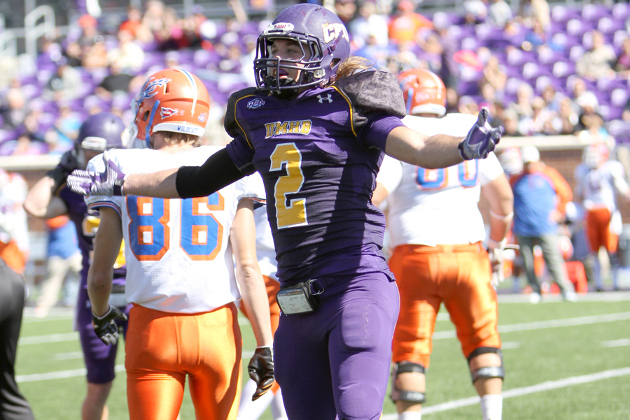 Cantue is the only ASC player to claim Preseason All-American honors from the publication. The Cru went 13-1 overall and won the ASC Championship with a 6-0 league mark in 2013. UMHB advanced to the Semifinals of the NCAA Division III National Championships before falling 16-15 to eventual national champion Wisconsin-Whitewater. The Cru was ranked #2 in the country by D3football.com last season and was #3 in the nation in the final American Football Coaches’ Association Top 25 Poll.